Imaging that the world will end tomorrow but you survived the apocalypse. If so, are you fit enough to outrun your enemies? If you are a person who needs such a motivation to get your fitness routine going, perhaps Doomsday Fitness app for iPhone might be just the right fitness app for you. You can have Doomsday Fitness iPhone app for $2.99 from iTunes App Store. With Doomsday Fitness app for iPhone, you can easily log your workout of the day (WOD), monitor your records, and share your achievements with your friends/colleagues via Facebook or Twitter or via good ol’ email. If you are not so sure about what to do for your daily workouts, you can pull one randomly from the workout of the day (WOD) to get yourself motivated and interested. There are virtually hundreds of workouts in the app that is designed to give you a great workout experience without tiring you to death. Its huge collection of CrossFit How-to videos helps you learn the workout routines, if you are not so sure about them. There are even days of rest built into the workout programs. Further, a calendar view and a search function that makes tracking workouts a breeze and the ability to back up your workouts and max weight data makes Doomsday Fitness an incredible tool to help you get in shape. In fact, there is more to Doomsday Fitness iPhone app than mere workouts. The app also provides everything from healthy recipes to survivalist books and forums. If you need music during workouts, you can access your iPod music from the app. Backup and sync between iOS devices is a handy feature. The data recovery section ensures that you don’t lose anything to any momentary indiscretion from your part. 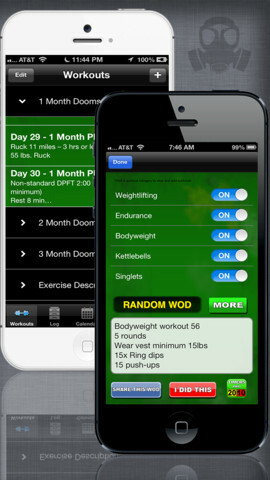 Doomsday Fitness application is compatible with iPhone 3GS, iPhone 4, iPhone 4S, or iPhone 5 running iOS versions 5.1 or later. The app is optimized for iPhone 5. Doomsday Fitness app for iPhone motivates you to remain fit. It got plenty of WOD and other tools to ensure that your fitness routine is progressing on track. The ‘how-to-do’ videos help you perfect your workout technique, whereas the collection of health recipes, and the survivalist books and forums educate the users that there is more to fitness than performing workouts/routines. iPod and SNS integrations come handy. Overall, the app tells you what to do in order to remain fit. Verdict: A pocket trainer worth trying out.